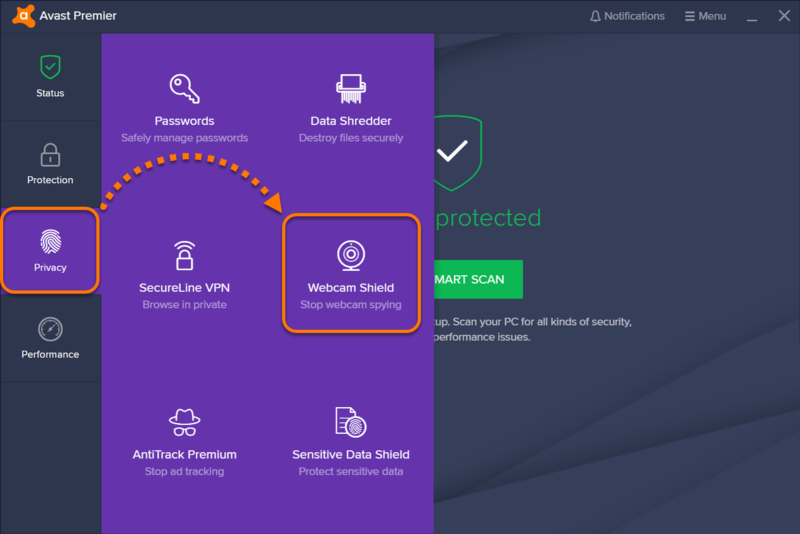 Open the Avast user interface and go to Privacy ▸ Webcam Shield. To disable the feature, click the green slider (ON) so that it changes to red (OFF). 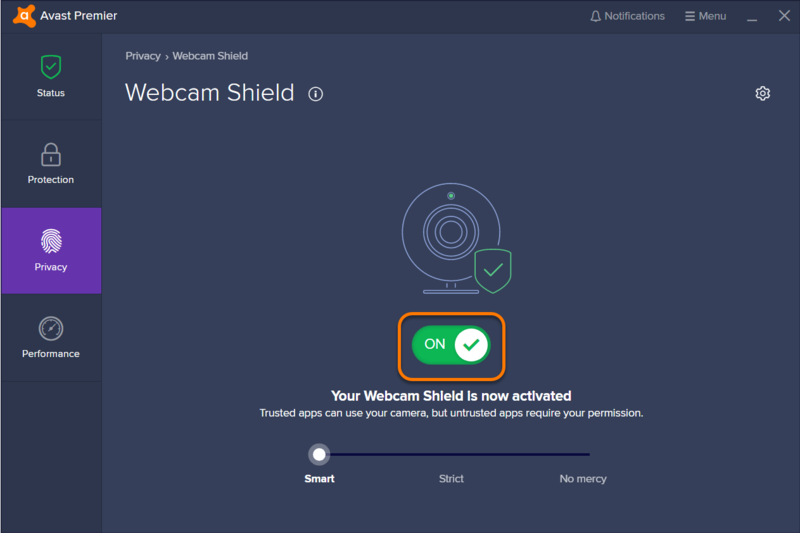 Smart: automatically allows trusted applications to access your webcam. 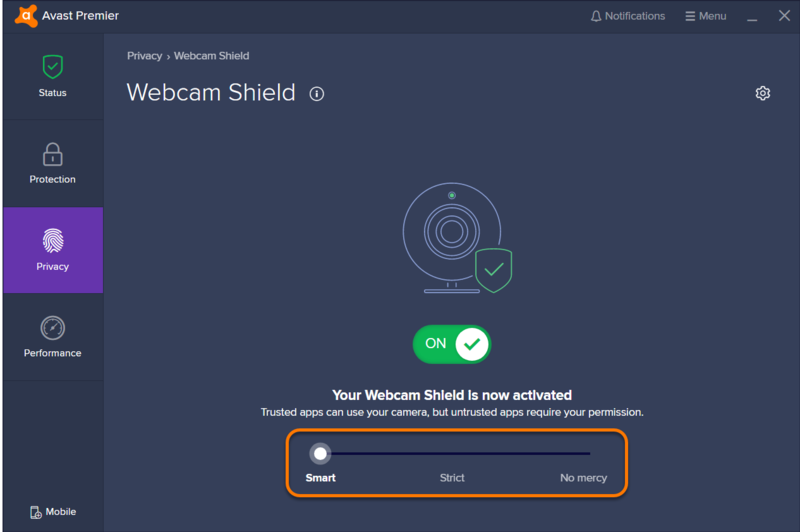 If an untrusted application attempts to access your webcam, a notification appears asking you to allow or block the application. After selecting an option, the application appears on the Blocked & Allowed apps settings screen where you can view its status and select additional actions. Strict: notifies you every time any application attempts to access your webcam and allows you to decide if the application is blocked or allowed. 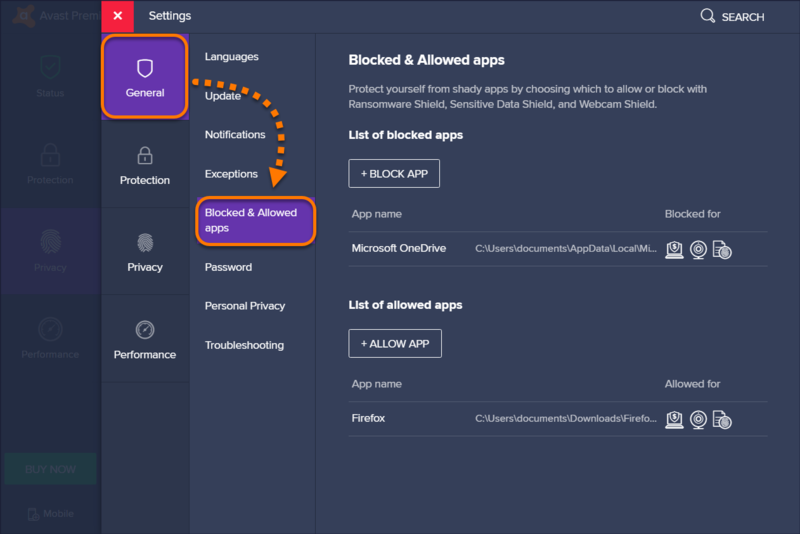 After selecting to block or allow an application, the application appears on the Blocked & Allowed apps settings screen where you can view its status and select additional actions. No Mercy: automatically blocks all applications that attempt to access your webcam. Select Privacy in the left panel, and click Webcam Shield. 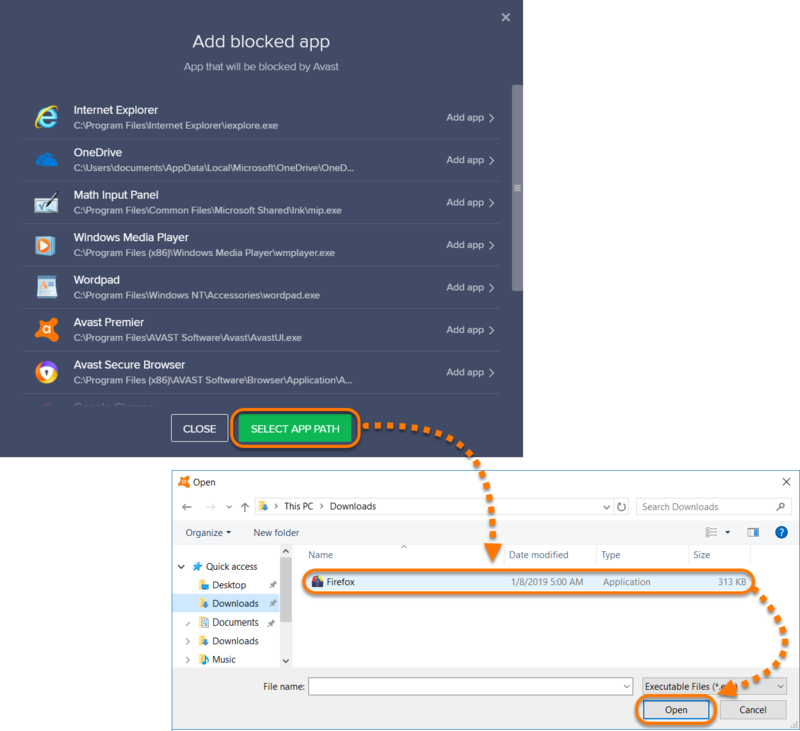 Click View allowed / blocked apps to open the Blocked & Allowed apps settings screen. Select an app from the predefined list. Click Select App Path, select the app in file explorer, then click Open. 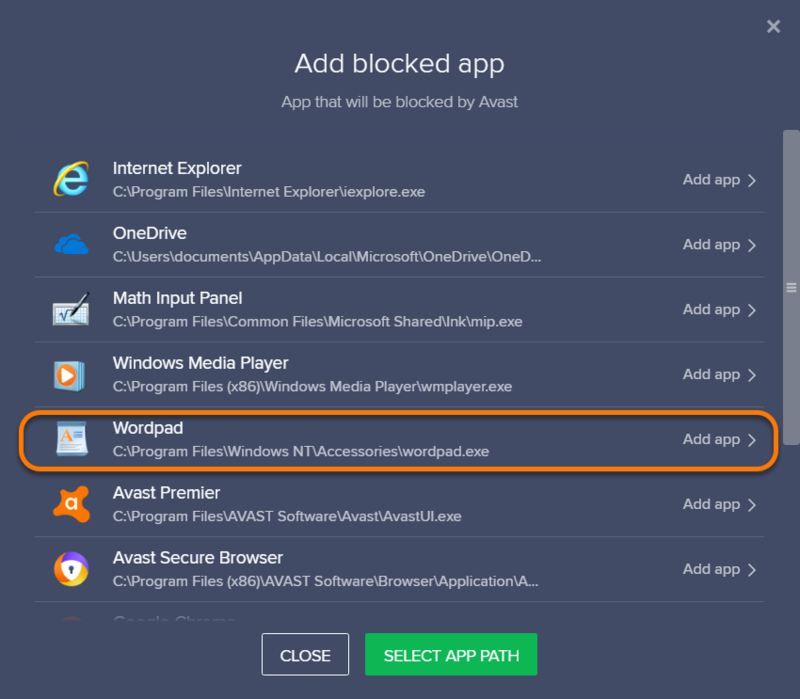 Tick the box next to the Avast features that will block the selected app (all ticked by default). Click Add to confirm. You can now view your blocked apps under the App name section of the Blocked & Allowed apps settings screen. Tick the box next to the Avast features that will allow the selected app (all ticked by default). Click Add to confirm. You can now view your allowed apps under the App name section of the Blocked & Allowed apps settings screen. 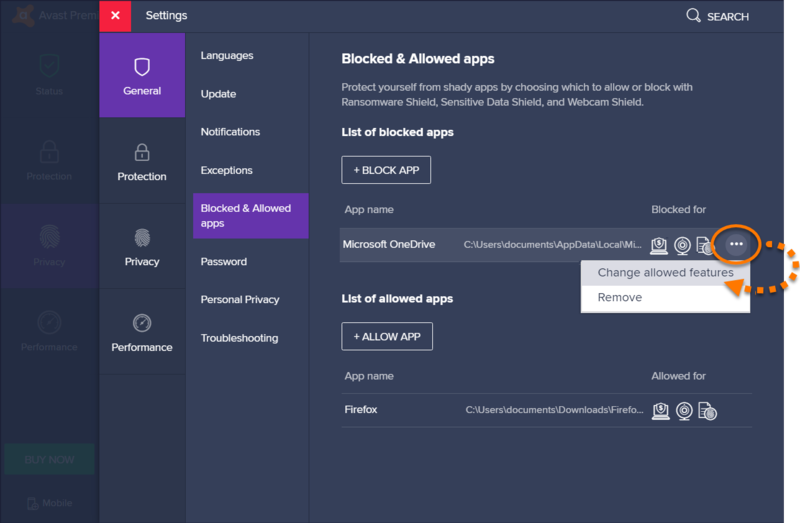 You can change the features allowed to interact with each app, or remove an app from either the blocked or allowed apps lists directly on the Blocked & Allowed apps settings screen. Ensure General is selected in the left panel, and click Blocked & Allowed apps. Hover your cursor over the app you want to remove from either list, then click the … icon, and select Change blocked features or Change allowed features from the menu that appears, depending on the list you want to update. 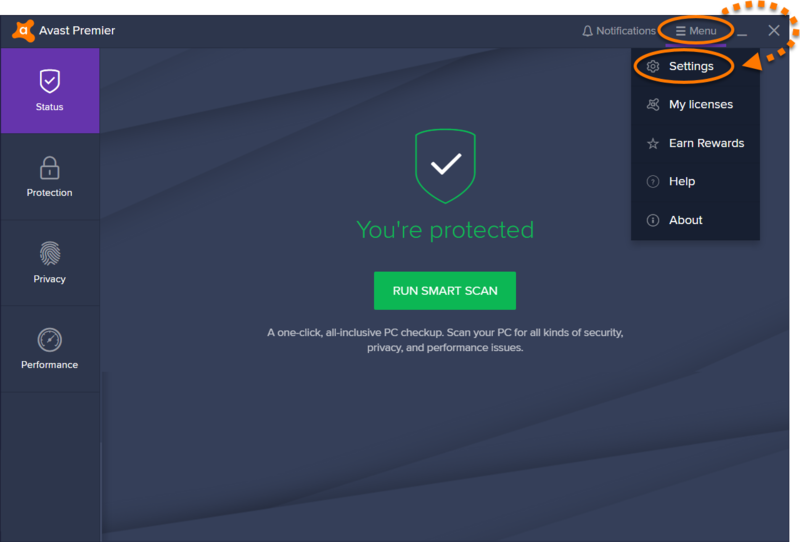 Tick the box next to the Avast features that will interact with the selected app depending on the list you want to update, then click Change. The features able to interact with the app are now updated. Hover your cursor over the app you want to remove from either list, then click the … icon, and select Remove from the menu that appears. The app is now removed from the list. Click the gear icon on the right-hand side of the Webcam Shield screen. Enable or disable Webcam Shield: Webcam Shield is enabled by default. To disable it for temporary troubleshooting purposes, click the slider so that it changes from green ( ON ) to red ( OFF ). 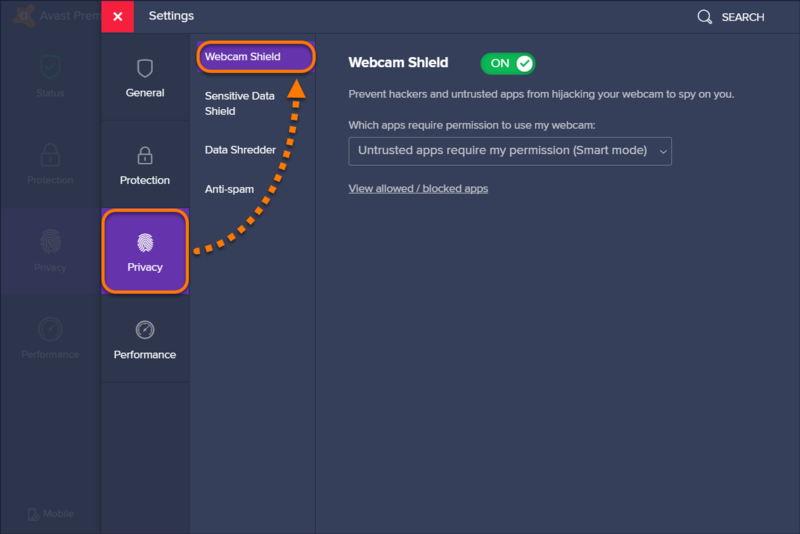 Sensitivity: use the drop-down menu to select how sensitively Webcam Shield monitors apps trying to access your Webcam (Smart mode is selected by default). Allowed / blocked apps: click this option to view your Blocked apps list and your Allowed apps list, or add new apps to either list. 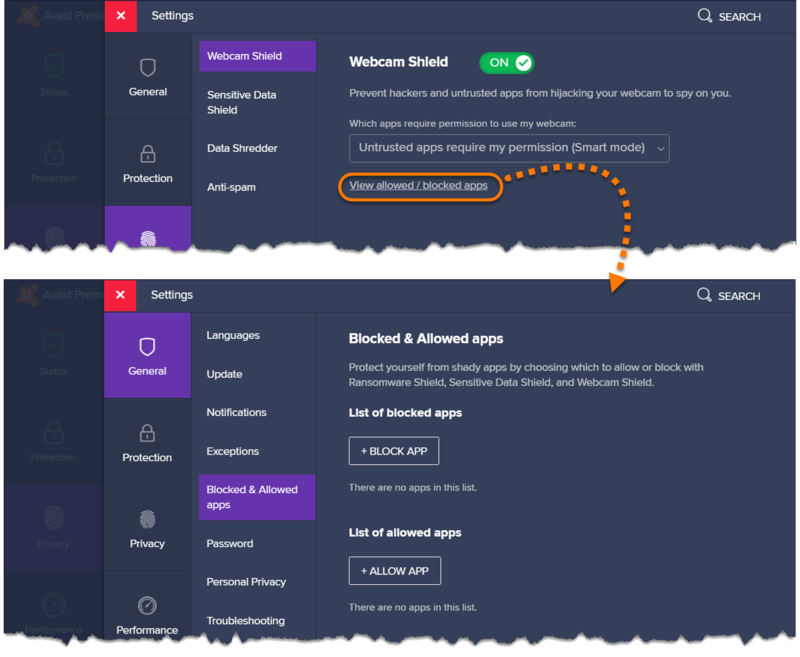 You can also access the Webcam Shield settings from the main Avast user interface by clicking ☰Menu ▸ Settings ▸ Privacy ▸ Webcam Shield.